* Invited contribution by Didier Paillard, recipient of the EGU Milutin Milankovic Medal 2013. Abstract. Since the discovery of ice ages in the 19th century, a central question of climate science has been to understand the respective role of the astronomical forcing and of greenhouse gases, in particular changes in the atmospheric concentration of carbon dioxide. 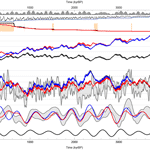 Glacial–interglacial cycles have been shown to be paced by the astronomy with a dominant periodicity of 100 ka over the last million years, and a periodicity of 41 ka between roughly 1 and 3 million years before present (Myr BP). But the role and dynamics of the carbon cycle over the last 4 million years remain poorly understood. In particular, the transition into the Pleistocene about 2.8 Myr BP or the transition towards larger glaciations about 0.8 Myr BP (sometimes referred to as the mid-Pleistocene transition, or MPT) are not easily explained as direct consequences of the astronomical forcing. Some recent atmospheric CO2 reconstructions suggest slightly higher pCO2 levels before 1 Myr BP and a slow decrease over the last few million years (Bartoli et al., 2011; Seki et al., 2010). But the dynamics and the climatic role of the carbon cycle during the Plio-Pleistocene period remain unclear. Interestingly, the δ13C marine records provide some critical information on the evolution of sources and sinks of carbon. In particular, a clear 400 kyr oscillation has been found at many different time periods and appears to be a robust feature of the carbon cycle throughout at least the last 100 Myr (e.g. Paillard and Donnadieu, 2014). This oscillation is also visible over the last 4 Myr but its relationship with the eccentricity appears less obvious, with the occurrence of longer cycles at the end of the record, and a periodicity which therefore appears shifted towards 500 kyr (see Wang et al., 2004). In the following we present a simple dynamical model that provides an explanation for these carbon cycle variations, and how they relate to the climatic evolution over the last 4 Myr. 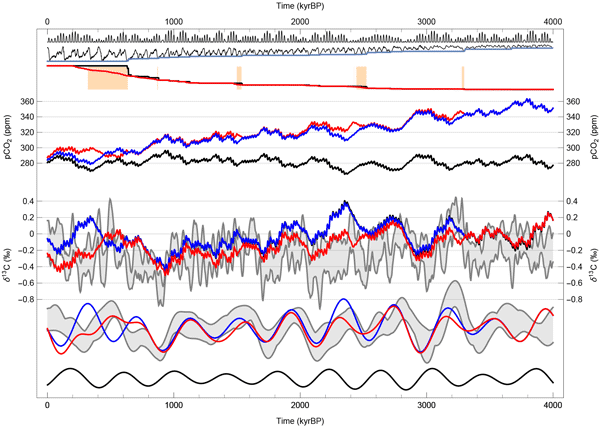 It also gives an explanation for the lowest pCO2 values observed in the Antarctic ice core around 600–700 kyr BP. More generally, the model predicts a two-step decrease in pCO2 levels associated with the 2.4 Myr modulation of the eccentricity forcing. These two steps occur respectively at the Plio-Pleistocene transition and at the MPT, which strongly suggests that these transitions are astronomically forced through the dynamics of the carbon cycle. How to cite: Paillard, D.: The Plio-Pleistocene climatic evolution as a consequence of orbital forcing on the carbon cycle, Clim. Past, 13, 1259-1267, https://doi.org/10.5194/cp-13-1259-2017, 2017. Ice ages are paced by astronomical parameters. On longer timescales, the astronomy also acts on climate, as evidenced by the 400 kyr signature observed in carbon isotopic records. In this paper, I present a conceptual model that links the astronomy to the dynamics of organic carbon in coastal areas. The model reproduces the carbon isotopic records and a two-step decrease in atmospheric CO2 that would explain the Pleistocene (~ 2.8 Myr BP) and mid-Pleistocene (~ 0.8 Myr BP) transition.